A fire has been reported at the NYU Langone Medical Center in Manhattan, the Fire Department of New York said on Wednesday morning, Dec. 14. Emergency crews are responding, PIX11 reported, which added that flames were reported on the fifth floor of the medical center. The city’s emergency office urged people to avoid circulating around the Medical Center area as firefighters were performing their fire fighting at the intersection of First Avenue and East 30th Street. At the moment there are not reports of casualties or injuries. 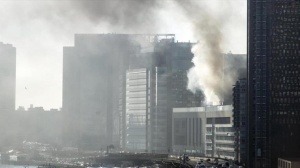 Authorities transferred smoke-affected patients to a safer area. Authorities continue to work on the causes that caused the heavy fire and say that the source of the fire may have been the construction materials of the roof. We have been involved in different hospital fire protection projects and we know how dangerous and harmful can be this hospital fires if they are not contained or stopped properly. Many of the sick people in hospitals can not be evacuated and this would mean their death. In order to guarantee the complete safety of patients, workers and visitors, we should carry out a complete passive protection installation since the building begins to be built: mortar, panels, false ceilings, insulations, smoke ventilators … you can see more solutions by clicking on Constructive Solutions.